GSoC 2008 Application – Accepted! With a delay of about one hour, the results for GSoC were announced on Monday. At 21:42 a mail from Google landed in my inbox. Subject: “Congratulations!”. My proposal was accepted! Before going into detail about the proposal, I wanted to thank Travis Reitter, my mentor in this year’s GSoC. He was a great support the last weeks, it was a pleasure and fun to work with him and certainly will be this summer. I’d also like to thank Rainer Müller, Christian Rieß and Karolina Osietzki for proof-reading and constructive criticism on the proposal. Communication is one of the most important parts of human life. In recent times computers and software made it not only easier to communicate, but helped to create new dimensions of interaction. Whether it’s email, chatting, voice or video, social platforms or blogs, everyone communicates somehow. This is an exciting development. But it is also a challenge for existing desktop systems to better integrate these new technologies. This is where Soylent comes in. 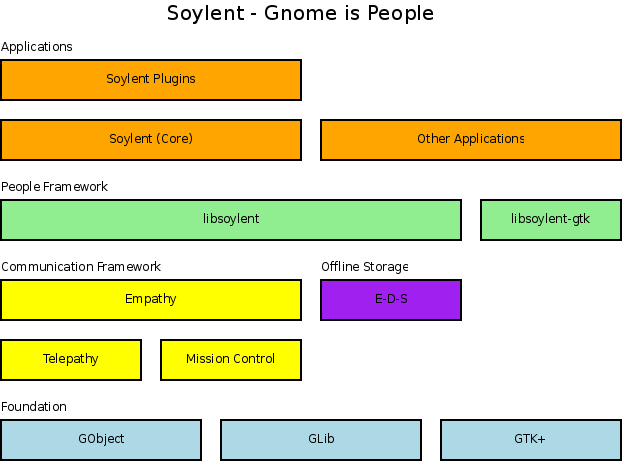 The Soylent Project is an attempt to really make people a part of the Gnome Desktop. Therefore it will provide a library, called libsoylent, that can be used by Gnome applications to have easy access to people-centric functionality. This includes system-wide access to contacts and groups, aggregating and managing individuals’ static information (e.g. name) and dynamic information (e.g. whether he / she is online) and much more. More information is available in the full application. This summer I will work on the people framework, namely libsoylent. This includes creating a convinient API, implementing the library and adjusting Soylent to use libsoylent. For now there is still some organizing left to do before I can dive right into Soylent. I’ll keep the GSoC Soylent Roadmap page up-to-date. Congratulations to everyone who was also accepted. I’m sure this will be a great summer ! This entry was posted in en, libsoylent and tagged Application, GSoC, libsoylent, Planet SoC on April 23, 2008 by Noya.